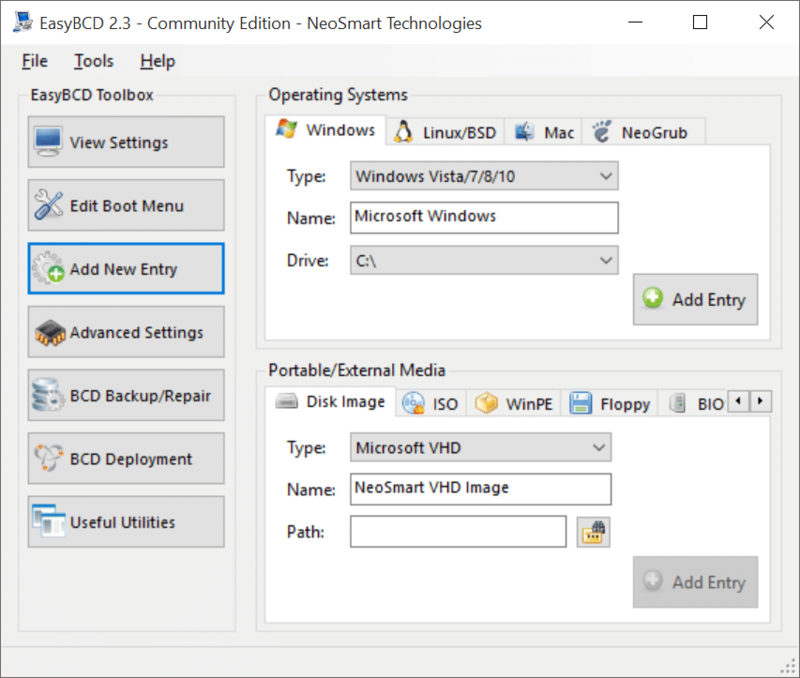 After three years of extensive development and testing, NeoSmart Technologies has released EasyBCD 2.3 with full support for Windows 10 and EFI. For those who are not aware, EasyBCD is the best software out there to manage boot entries. With EasyBCD, which is free for non-commercial use, you can add new boot entries, edit existing entries and delete entries safely. The user interface of the software is easy-to-use. The little software allows you prepare bootable USB sticks of Windows operating system as well as troubleshoot Windows, startup and other bootloader issues. Additionally, you can use the software to add VHD, ISO, and WIM image to the boot the menu. The software can also be used to boot from USB drives even if your PC doesn’t support booting from USB. The latest version of EasyBCD, which is 2.3, feature full Windows 10 support. 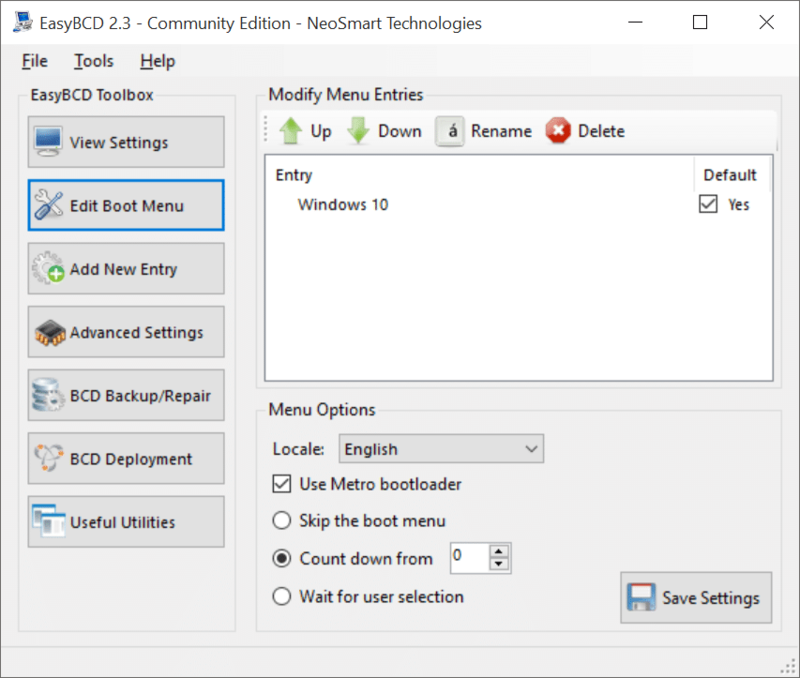 In addition to that, it now allows you easily enable or disable the metro boot loader or boot menu, making it easier to quickly switch between Windows 7-style boot menu and the new Metro or modern boot selection menu. The user interface of the application has not changed but it’s easy-to-use and navigate. The full EFI support makes it possible to prepare bootable USB drives for EFI environments. Like previous versions, the latest version also allows you add, edit and mange Linux and Mac entries. The tool comes with options to backup, repair and reset BCD configuration. As mentioned before, EasyBCD 2.3 is completely free for non-commercial use. If you have installed Windows 10 in dual-boot with a previous version of Windows, Mac or Linux, this is a must have application. EasyBCD 2.3 is compatible with both 32-bit and 64-bit Windows 10, 8.1, 8, and 7. I have 5 windows 10 pro operating systems (hard drives) on one (1) PC. I installed Easy BCD on the main system and again on one other hard drive. I cannot get access to the 2nd operating to enable all 5 five operating systems on one 1 easybcd startup. I tried the repair tool without any success. Please advice and assist to enable me to utilise all five 5 operating systems on one pc. I re-installed windows 10 again, but it does not recognise the other 4 systems. Even easy bcd does not recognise the other one operating system. Red, the following guide should help you in hiding volumes. NOTE: The guide works for Windows 8 and Windows 10 as well. Is there any feature that will hide a volume after booting on Windows 10 and 8.1? My OS’s on other logical volumes are showing up, and are being assigned letters. I do not want the volumes shown for multiple reasons.